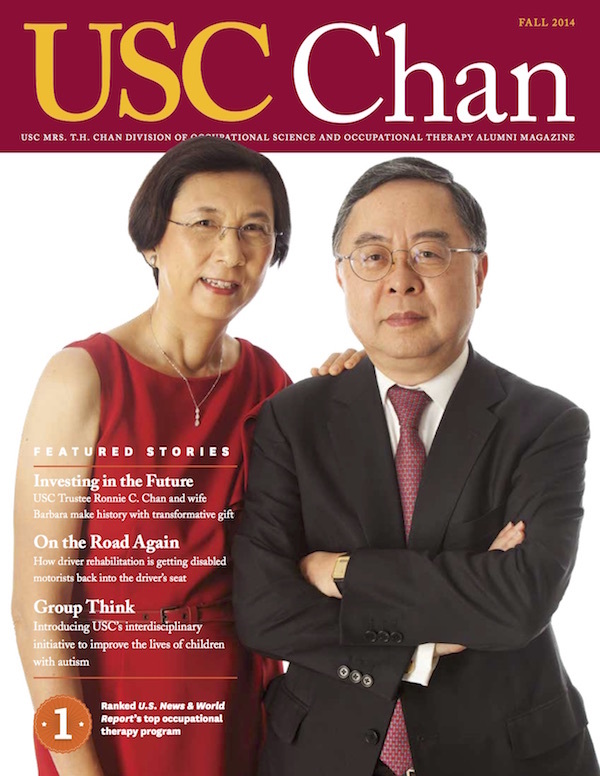 With their $20 million gift to the division, USC Trustee Ronnie C. Chan and wife Barbara make history and cement a legacy. The universe works in mysterious ways. That was the message — equal parts gratitude and awe — delivered by Associate Dean Florence Clark at a confidential gathering of division leaders in early August. A cryptic email summoned select faculty members to this off-the-record meeting and as the room filled, hushed speculations swirled. Yet the plastic flutes of champagne being passed around — not the typical beverage for a weekday business meeting — signaled the bombshell announcement ahead. With her husband, senior computer consultant John Wolcott, smiling beside her and with tears welling in her eyes, Clark broke the suspense: A $20-million gift agreement had been reached to name and endow the division for all time. Gasps of disbelief crescendoed into unanimous applause. Institutional naming gifts, which guarantee a program’s existence for all time, are unheard of within occupational science and occupational therapy. They are indeed so rare that no occupational therapy educational program had ever been previously named. The implication of the announcement settled upon the room: USC was realizing another accomplishment in a long line of firsts, the benefits of which would one day ripple throughout the profession and across the world. The long-impossible dream to permanently endow the division was coming true. Occupational therapy is a career choice rarely made lightly. Just ask any therapist. More often than not, you will hear a story forged in a crucible of injury, illness and trauma on one hand, and recovery, healing and hope on the other. Ten years ago, assistant clinical professor Adley Chan ’07, MA ’08, OTD ’12 was an undergraduate sophomore student at USC when he received an email that, in retrospect, changed the trajectory of his entire life. The message notified Chan that a good friend who was traveling through Louisiana was injured in an automobile accident, had sustained a traumatic brain injury and was currently in a severe coma. As days turned into weeks, Chan decided to visit the friend’s family to do whatever possible to help console them. But when he arrived at the hospital, Chan was greeted with an incredible surprise: The friend had awoke from the coma. At the hospital Chan watched intently as occupational therapists began the long process of physical and cognitive rehabilitation. After he returned to campus in Los Angeles, Chan was in for another surprise. At the beginning of his Monday morning class, an occupational therapy student ambassador gave a brief presentation about the profession and the undergraduate major at USC. The following semester Chan knew he had to enroll in the undergraduate course, OT 250: Introduction to Occupational Science and Occupational Therapy. What felt right — if only as moral support for a rehabilitating friend — grew into something more. This was more than coincidence; it seemed like a calling. Having witnessed the impact of such a catastrophic condition on a friend, Chan felt called upon to help others through similar circumstances. He soon declared occupational therapy his undergraduate major and continued at USC to earn both his master’s and clinical doctorate degrees in occupational therapy. A decade later, Chan’s friend is now back living life to its fullest, happily married with three children and able to work full-time. Such a recovery could not have been fully possible without occupational therapy. The phrase Trojan Family is often used as a metaphor for USC’s extensive and devoted alumni network. 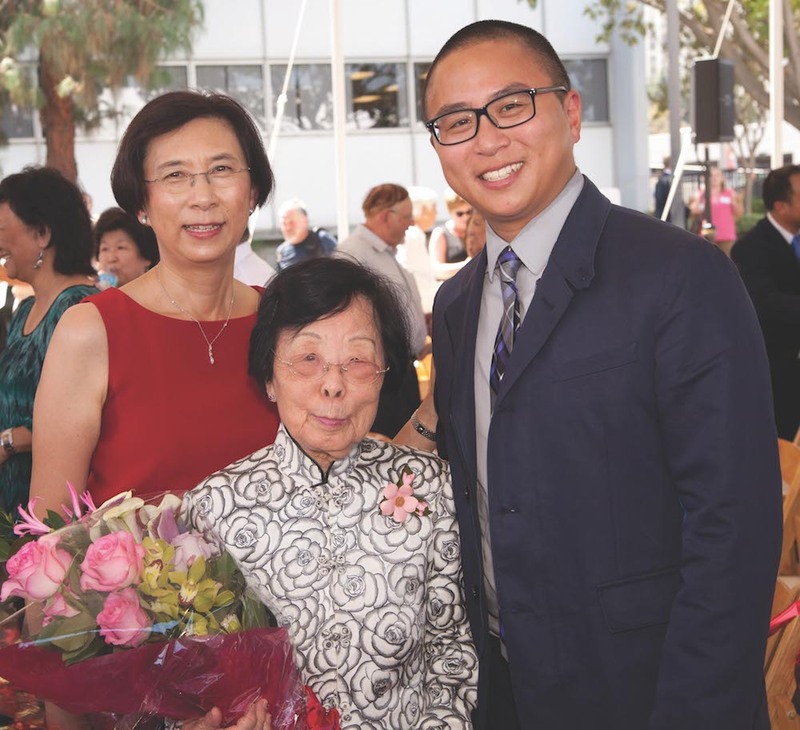 Quite literally, Adley Chan belongs to another Trojan family — his older brother Adriel earned a bachelor’s degree from USC in 2004 and his father Ronnie C. Chan earned his MBA degree from USC in 1976. In the decades since, the elder Chan built his family’s Hong Kong-based business into a thriving multinational corporation. He became the chairman of Hang Lung Group Limited and its subsidiary Hang Lung Properties Limited which, with its wide-ranging portfolio of retail, commercial and residential properties, stands among Hong Kong’s leading property companies. He also co-founded the Morningside Group, a private investment firm that owns and manages industrial and service companies throughout the United States and Asia. 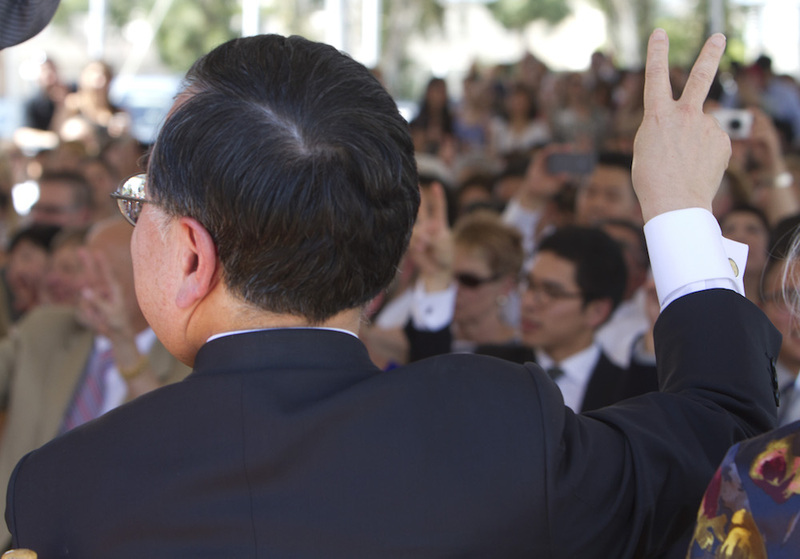 In 1995, former USC President Steven Sample welcomed Chan to the USC Board of Trustees and later honored him with the 2009 Asa V. Call Achievement Award, USC’s most prestigious alumni award. As the youngest Chan progressed through years of occupational therapy education, the elder Chan and his wife Barbara grew to become good friends with Clark and Wolcott. And with their resolute commitment to philanthropic endeavors in partnership with health and education institutions throughout the world, the Chan family would soon add another generous act to their names. 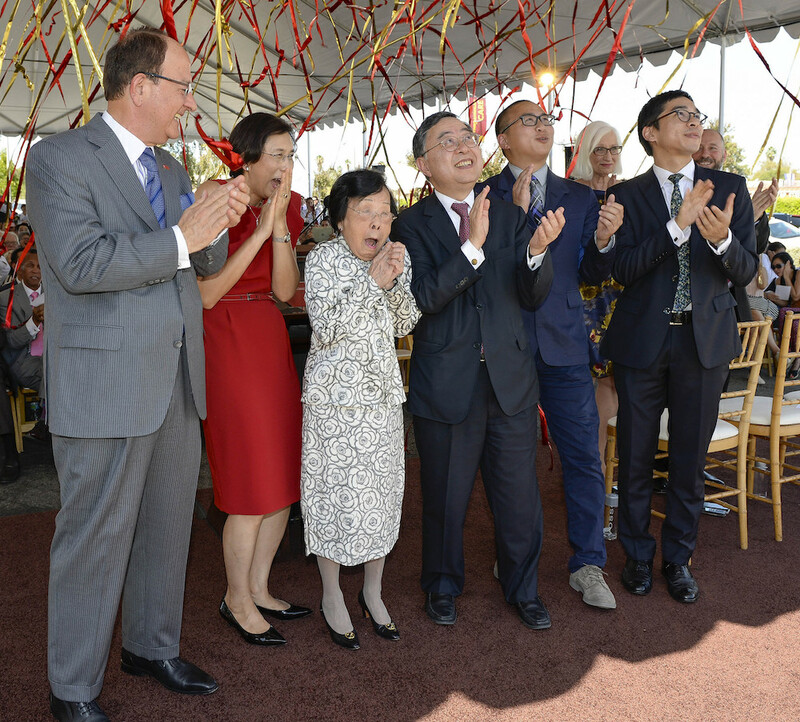 At a September celebration hosted on the USC Health Sciences Campus, USC President C. L. Max Nikias made the announcement official: Ronnie and Barbara Chan committed $20 million to the division of occupational science and occupational therapy, the first naming gift and largest ever made to any occupational therapy program in the history of the field. It was the second major gift the Chans had made to a U.S. university in as many weeks, with Chan’s Morningside Foundation making a substantial gift to Harvard’s School of Public Health in honor of patriarch Mr. T.H. Chan on Sept. 8. The USC gift was made in honor of the Chan family’s matriarch, Mrs. T.H. Chan, who was trained as a nurse in Northern China during the mid-20th century. The gift established an endowment in perpetuity and named the division the USC Mrs. T.H. Chan Division of Occupational Science and Occupational Therapy. How the Chans’ generosity is set to make an impression on the division and the profession. The $20-million gift provides a financial endowment to keep the division funded in perpetuity. The gift also renames the division, now officially known as the USC Mrs. T.H. Chan Division of Occupational Science and Occupational Therapy. It also establishes and endows the Mrs. T.H. Chan Professorship in Occupational Science and Occupational Therapy. Associate Dean and occupational therapy icon Florence Clark has been named the professorship’s first holder. Finally, the gift extends the division’s global reach by establishing a partnership with a top Chinese university to create a graduate-level OT program in China. Nikias then introduced Ronnie Chan, who was treated to a standing ovation by the standing-room-only crowd as he took the podium. The gift will also extend the division’s international reach thanks to the USC Mrs. T.H. Chan Occupational Therapy China Initiative. This focused, short-term initiative will establish a partnership between the division and a top Chinese university to develop a graduate program in occupational therapy in China. In addition, the gift endows the Mrs. T.H. Chan Professorship in Occupational Science and Occupational Therapy. Florence Clark will be installed as the first holder of the professorship.